My boyfriend is heading to Hartford to see his family for Thanksgiving, and I wanted to send a dessert that would be a little different from everything else on the table, and transport well. Thanksgiving is a pie holiday—and I love pie—but the idea of traveling with a pie while taking public transportation in bad weather on a three-hour trip to Connecticut just gives me anxiety. So, I decided to make cookies. The inspiration to make these cookies is the Little Buddy Biscuit Company of Brooklyn, a wonderful cookie shop that unfortunately closed earlier this year. Little Buddy made the most incredible Ginger Molasses Cookies—packed with ginger flavor, perfectly chewy, and huge. This is the first time I’ve worked with ginger as a baking ingredient—and it appears twice in this recipe: in ground form, and as crystallized ginger, which gives these cookies a memorable zing. This is also the first time I’ve worked with molasses, and now that I have so much left over, I may be bold enough to make a pecan pie (but that’s another entry). 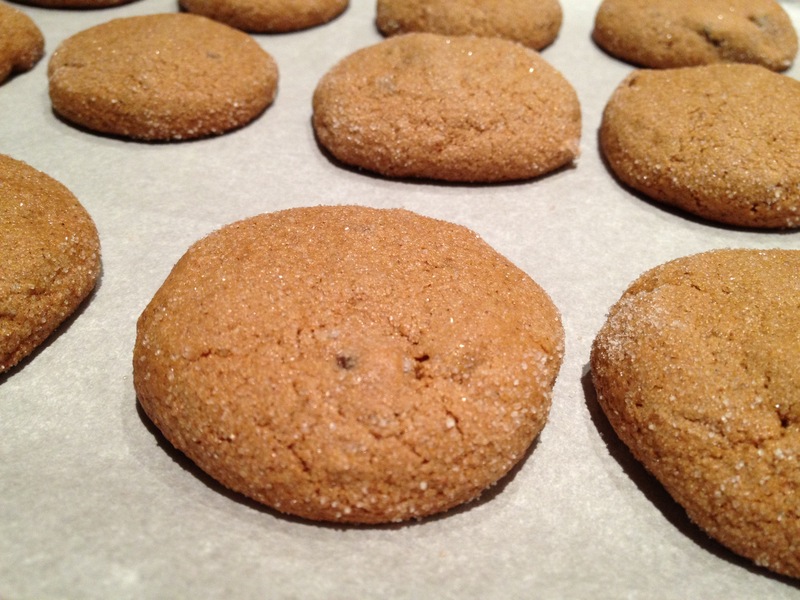 Without further ado, here is the step-by-step guide to making these beautiful, spicy, marvelous cookies. 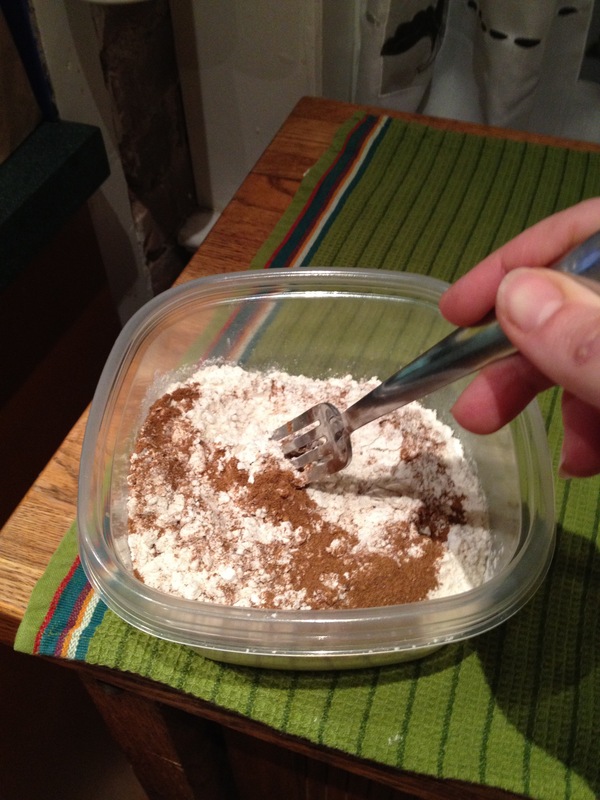 Combine all of your spices (cinnamon through allspice), flour and baking soda. Sift everything into a large bowl to ensure all the flavors are evenly distributed throughout, and set aside. 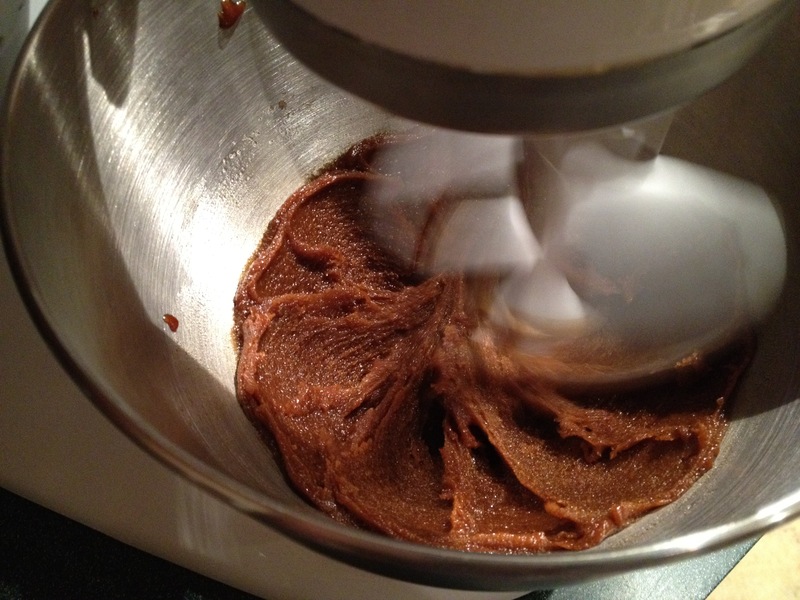 In the bowl of a standing mixer fitted with a paddle attachment (or in a large stainless steel bowl), combine the brown sugar, molasses and vegetable oil. Mix on medium speed for 5 minutes. Set the timer for this one – it’s essential to mix these ingredients this long to ensure they’re fully blended (similar to the way you would cream butter and sugar together in other recipes). The mixture of oil, molasses and sugar after 4 minutes of beating. Turn your mixer or beaters to low speed, and add the egg, beating for 1 minute. 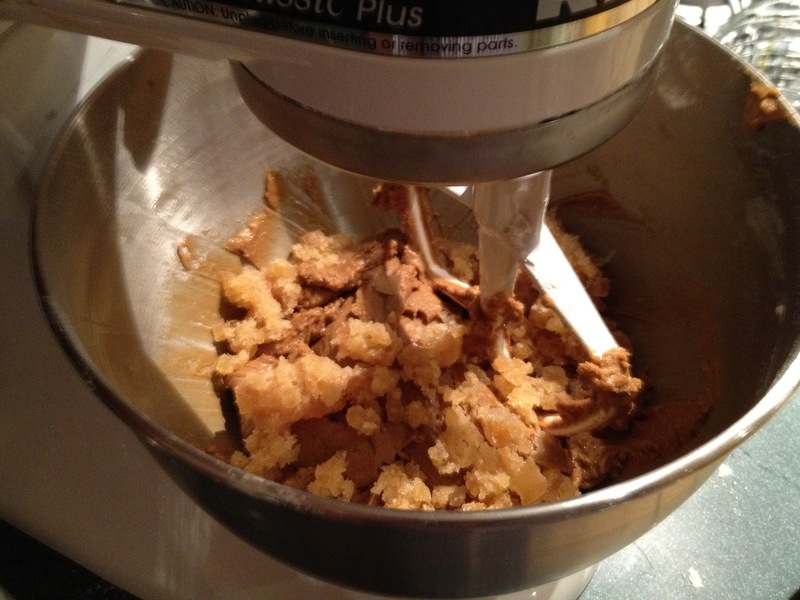 Turn the mixer or your beaters off, and scrape the sides of the bowl with a rubber spatula. Resume beating on low speed for another minute. 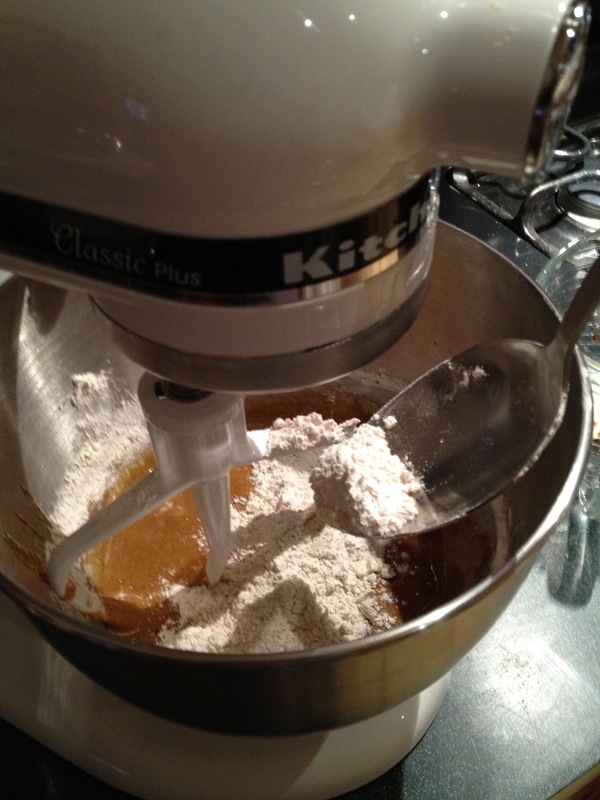 With the mixer or beaters still on low speed, slowly add the flour/spice mixture. You can pour slowly from the bowl, but I find that tends to get messy, so I use a large serving spoon to add the flour/spice mixture incrementally. You may have to pause mixing every now and again to scrape the sides of the bowl with a rubber spatula. 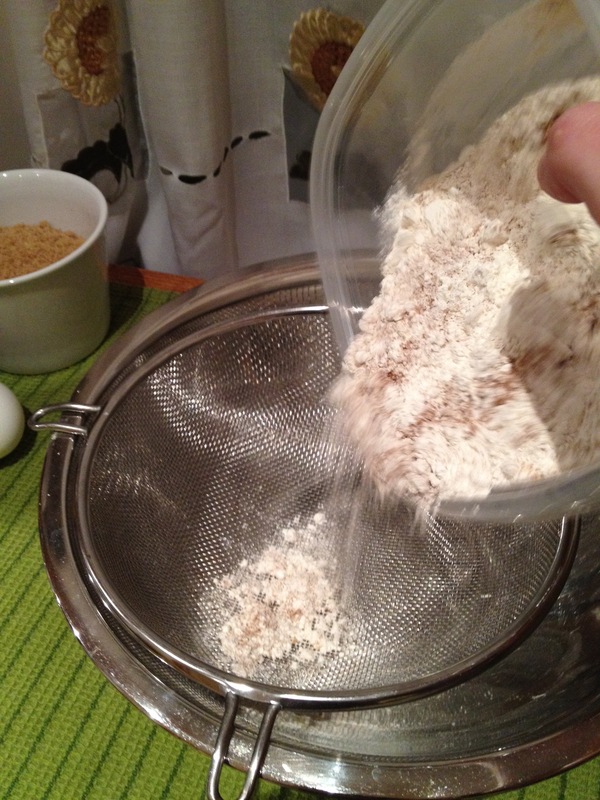 Once all of the flour/mixture has been added to the bowl, beat on medium speed for 2 minutes. If you find that the dough is becoming too dry (perhaps your mixer or beaters are stuttering or stalling, like my mixer was), add 1 to 2 tablespoons of milk, and continue mixing until all ingredients are incorporated. Add dry ingredients 1 spoonful at a time, as they incorporate into the dough. 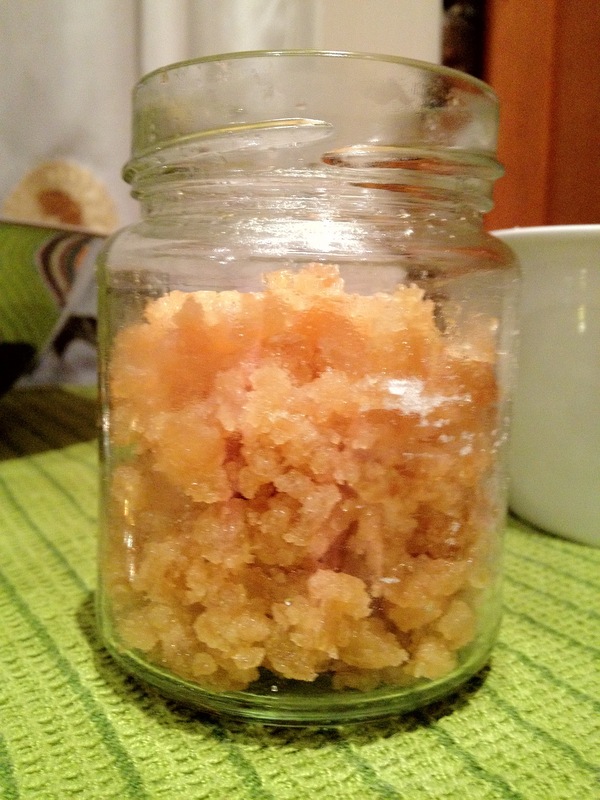 Finally, it’s time to add the crystallized ginger. This is pretty sticky stuff once it’s chopped up, so you’ll want to mix it in, on low speed, until it’s fully incorporated into the batter. Scrape the dough around the sides of the bowl and double check everything has been fully mixed and incorporated. While you could bake the cookies immediately after mixing the dough, I recommend refrigerating the dough overnight. It’s a very sticky dough, and very hard to roll in your hands while it’s soft. 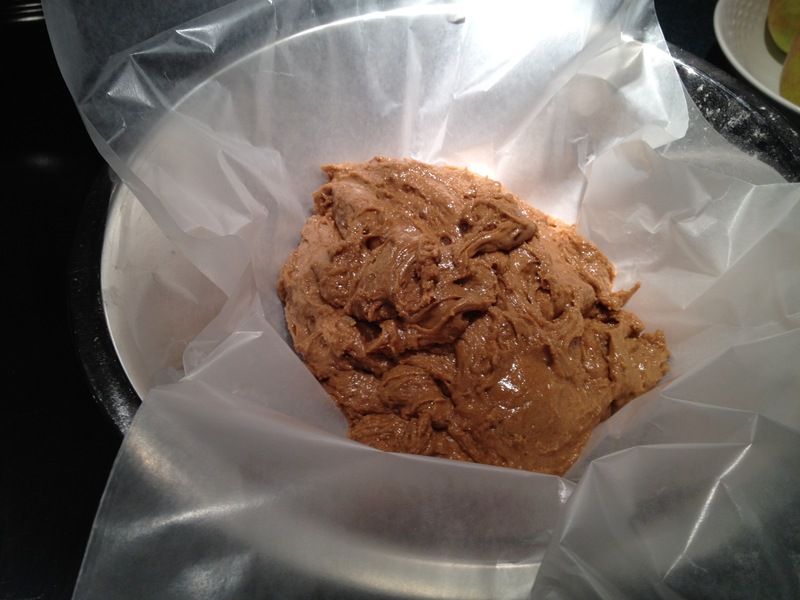 So – grab a clean bowl, lay a large sheet of wax paper on top of it (see photo) and scoop your dough onto the wax paper. Wrap it up, then put it in a zippered plastic storage bag and put it in the fridge. Have a cup of tea, lick the dough off the beaters if you’re not frightened of raw eggs (I’ve been doing it since I was 5 years old, and I’m 30 now, very healthy). Clean up the lovely mess you’ve made, and go to bed. We’ll bake together tomorrow. 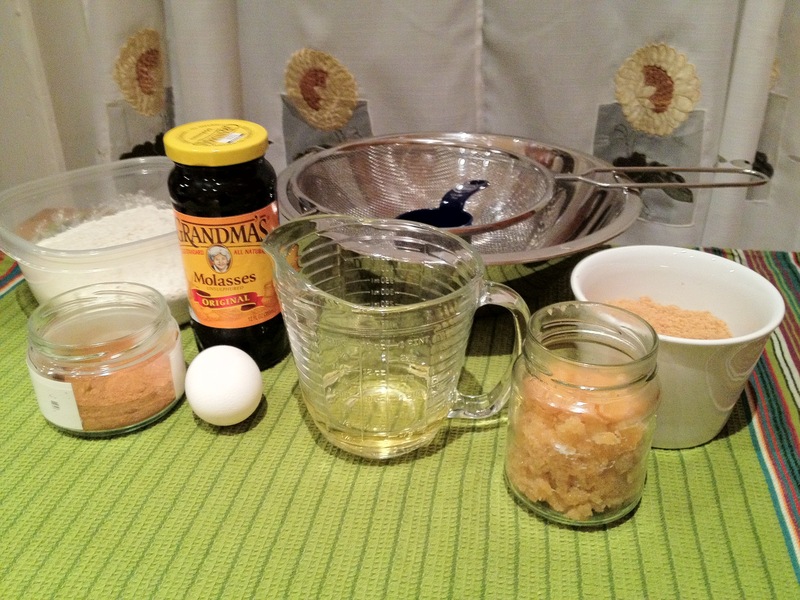 This entry was posted in Recipes, Sweet Tooth and tagged baking, barefoot contessa, cookies, desserts, ginger, ina garten sugar, little buddy, molasses, recipe, step, thanksgiving. Bookmark the permalink.